One of the things that keeps croppin' up is what to do with the motor. When the bike was first put together in the late '70s, Crinkle Black crank cases and chromed outer cases was cool and groovy, and all credit to the chrome platers of the day, the vast majority of it has lasted very well. One thought was to leave the plating on the covers and to the main cases gloss black, as seen on Vincents, the black not the chrome. 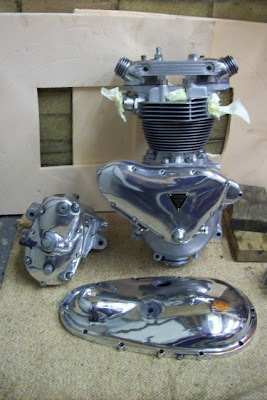 Would certainly look nice and be pretty unusual on an old Brit nowadays, but there's always the chance that it would look anachronistic when the bike is fully finished as bright plating elsewhere is being kept to a minimum. It's difficult to imagine any red blooded male not getting excited about these pictures. 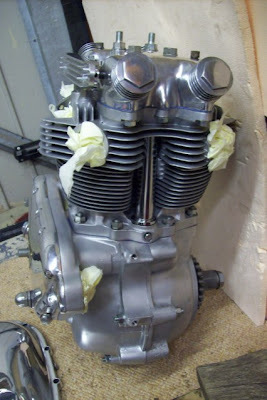 Bearing in mind, the long stroke A7 has cast iron head and barrels, it would not look this stunning, but maybe gloss black on those parts and a vapour blast on the crank cases with polished outers may well do the trick. 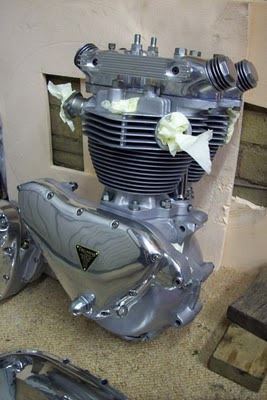 Can't wait to see the finished bike that this is going into.